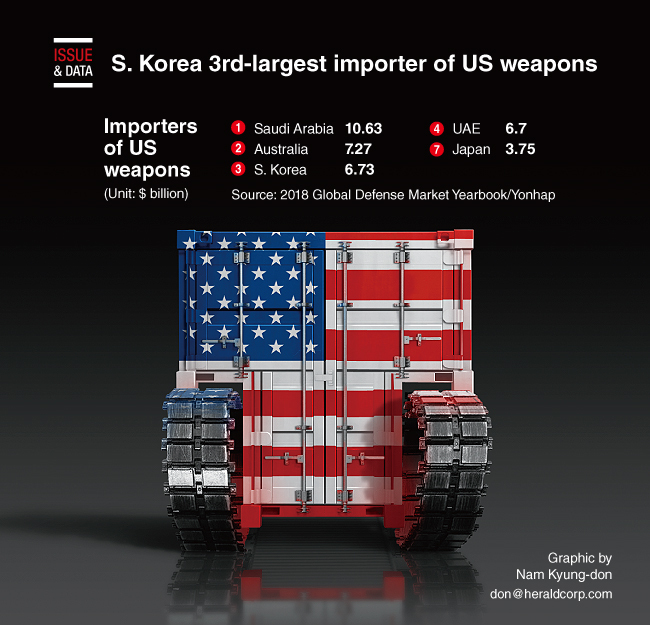 South Korea bought US weapons worth a total of $6.73 billion from 2008 to 2017, becoming the third-largest importer of arms produced by its ally, according to an annual analysis of the defense market. According to the 2018 Global Defense Market Yearbook by the state-run Defense Agency for Technology and Quality, Saudi Arabia topped the list of importers of US weapons, followed by Australia, South Korea and the United Arab Emirates. In the decade starting 2008, Saudi Arabia imported $10.63 billion worth of US weapons, while Australia and the UAE purchased $7.27 billion and $6.7 billion worth of American arms, respectively, the yearbook said. Japan, a core Asian ally of the US, took seventh place with its purchase of $3.75 billion worth of US weapons in the same period.